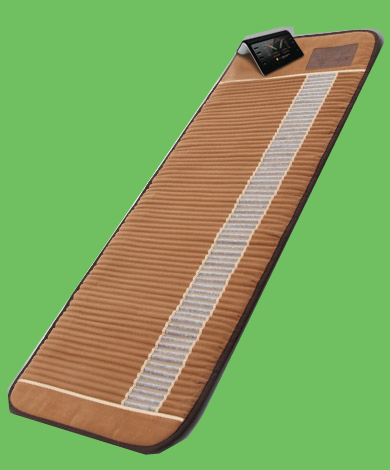 A BioMat is a 17-layered pad that can lie on top of a massage table, your home mattress, or even the floor. It does three things for the body. 1. It does not give off electricity but instead converts AC current to DC current (which are bio-electrically compatible with the human body), through a computerized control panel and produced with Texas Instruments parts. This creates Far Infrared Rays (FIR). FIR is nature's invisible light, and was discovered by NASA to be the safest, most beneficial light wave. 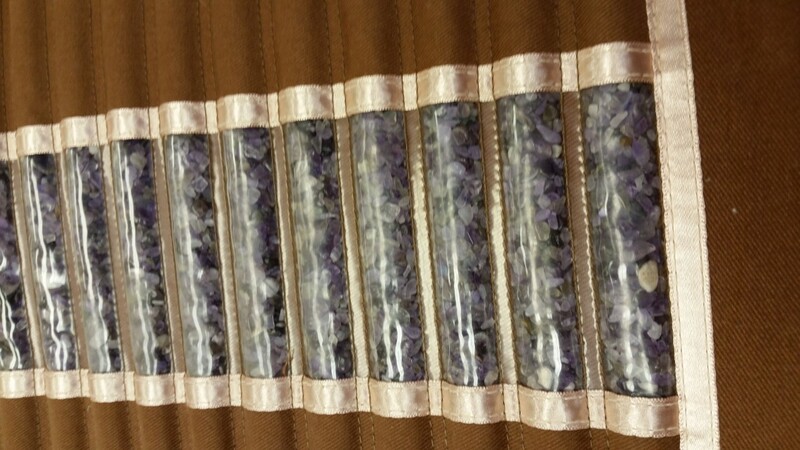 As FIR pass through the rows and rows of embedded Amethyst Crystals, the crystals elongate the wave length and emit Long Wave Far Infrared Rays (8-12 microns), which penetrate 6-8 inches into the innermost recesses of the body, stimulating healing and regeneration of cells throughout the body. 2. Phases of electrical slowing still convert AC to DC current, but allow the Kurare Super Fiber to generate a discharge of Negative Ions into the body through conduction. This immediately changes the body's electrical field, converting positive ions (which are stressor and illness related ions) to negative ions for balance, calm, wellness, and giving an overall alkalizing effect to the body, reviving the cell and helping with EMFs. 3. The Richway BioMat EMF Interceptor acts like a lightning rod, safely conducting the EMF energy away to ground it. EMF (electromagnetic fields) describes the invisible and magnetic fields attacking our bodies from all the manmade electrical things in our world: microwaves, TV, appliances, cars, computers, cell phones, lighting systems in our homes, offices, trains, planes, and buses, including environmental pollution, which tilts our body ion balance towards positive. This physiological ion imbalance can be detrimental to the body, being associated with anemia, allergies, shoulder pain, lumbago, rheumatism, neuralgia, headaches, kidney problems, imbalanced autonomic nervous system function, insomnia, and fatigue. Why do people use BioMats? BioMats are used for many different reasons, and the varied levels of heat promote different body functions. People choose to use them to help relieve symptoms of various kinds of discomfort and to maintain a balanced, peaceful, healthy body even to the cellular level in multiple body systems. They have powerful detoxification properties. Simply lying on a Richway BioMat may promote a feeling of well-being for a healthier mind and body. What are the Benefits of the BioMat? Where can I try the BioMat? Essence of Pure Living offers BioMat sessions. Contact Sherry to schedule an appointment! Can I purchase my own BioMat? Sherry is a Richway BioMat distributor with Richway International, Inc. The most popular BioMats are the BioMat Professional and the BioMat Mini. Contact Sherry at 814-883-0006 for information on financing options. Follow this link for more detailed information about BioMats.